My daughter has loved American Girl dolls since they first came out in the mid-1980's. She took this photo last fall of her beautiful 20+-year-old Kirsten dressed in Målfrid Gausel's pattern 0027. I had knitted this lovely pattern in a Knit-A-Long with several other women on an online website. It was so wonderful to have their help and support while working on this outfit, and I look forward to knitting more with them in the future. 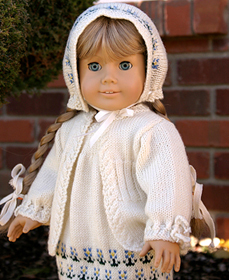 The Forget-Me-Not pattern was especially meaningful for my daughter and me because we had just heard that the Kirsten doll was going to be archived soon. In a way, this is a tribute to Kirsten, a lovely doll we will never forget! My daughter has passed on her love of American Girl dolls to her three daughters, and they have all earned the money to buy themselves some of these lovely dolls. We have all enjoyed getting together to play with our dolls and create wonderful, fun times we will never forget! What a beautiful story about you and your daughters! It is a very lovely pattern! I have this pattern, also. Your knitting is gorgeous. Good luck on your future outfits. What a beautifully knitted outfit. How nice that you can share your love of dolls with younger members of your family. I love your story and your picture. How sweet. I just ordered yarn to make this exact dress. Thanks for sharing your darling photo. I am so glad you succeeded so well and are pleased with the result! That means a lot to me! What a sweet story! Kirsten was one of my daughter's first American Girls dolls also. She and I were both very surprised to hear that Kirsten was being archived. It still seems like a mistake to me. Your outfit turned out beautifully. I'm really enjoying this chance to see all the projects again.